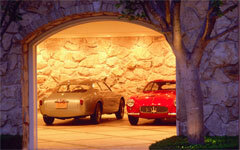 Inspired by their passions, with few or no restrictions, the country's top enthusiasts have created the Ultimate Garages. We celebrate these collectors and motor nuts as we visit their secret automotive shrines and learn how to create a garage where we can comfortably spend time with cars, friends and fellow enthusiasts. 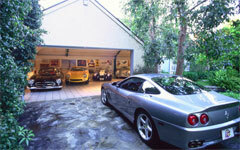 We will visit and review Ultimate Garages of all sizes, shapes and budgets, so check back often because we'll be adding new Ultimate Garages soon. Stanley Gold is an example of what can happen when enthusiasm for a specific brand grabs hold like an obsession. Yates acquired the nickname "Assassin" for scathing reviews he wrote about new cars he didn't like. 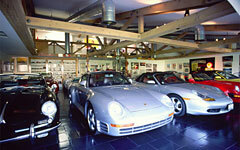 But no label accurately captures the passion for cars that comes out when he talks about his carriage house. Bruce Meyer is a man eager to share. A toy company made a miniature copy of his 13-car garage to use as the packaging for a set of expensive toy versions of four of America's most famous cars. 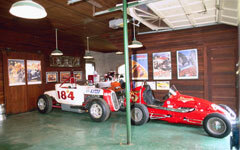 Touring David Sydorick's recently expanded garage in California you are taken into the environment that you might imagine famed designers Zagato and Pinin Farina had planned for their specially bodied Alfa Romeos and Ferraris and Maseratis all along.